Persistent Slabs form when a persistent weak layer is buried by additional layers of snow. The problem persists after storm and wind slab instabilities have stabilized. The persistent weak layer can cycle through periods of sensitivity from reactive to nonreactive due to changes in weather conditions such as new precipitation, wind loading, strong solar radiation, and/or rapid changes in air temperature. This Persistent Slab was triggered remotely, failed on a layer of faceted snow in the middle of the snowpack, and crossed several terrain features. The spatial distribution of Persistent Slabs is dictated by the distribution of the culprit weak layer. The weak layer distribution is dictated by the weather patterns responsible for its creation. Thus, Persistent Slab distribution can range from widespread across terrain to very specific terrain features. They can occur at all elevations and on all aspects. Persistent Slabs can be triggered remotely, and on low-angle to steep slopes. Consult the backcountry avalanche forecast to determine where in the terrain this problem exists. A Persistent Slab avalanche that propagated over several terrain features. Persistent Slabs can be a problem during any time of the snowy season. Anytime you have a slab resting over a reactive persistent weak layer, you have a Persistent Slab problem. This problem can develop during the fall and last well into the spring. Persistent Slabs can be distinguished from Storm and Wind Slabs by how the fracture lines fail in the terrain. Unlike storm instabilities, Persistent Slabs are commonly triggered remotely, from flat areas, and failures can propagate across terrain features like ridges, ribs, and gullies. It is possible to have a Persistent Slab problem that is susceptible to human triggering but not produce many spontaneous avalanches. 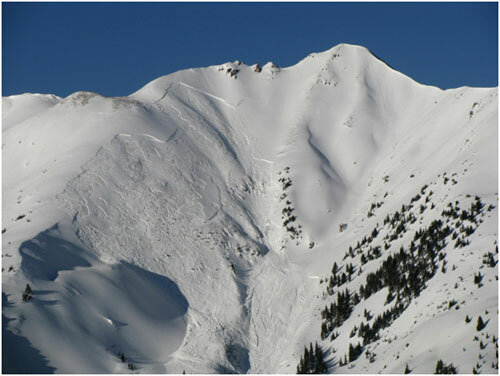 The lack of avalanche activity does not always indicate the absence of a Persistent Slab problem. You can look for persistent weak layers in snow profiles, and perform snowpack tests to gauge sensitivity and distribution of a Persistent Slab problem. Consult the backcountry avalanche forecast to determine where in the terrain this problem exists. Persistent Slabs can be triggered by light loads and weeks after the last storm. They are commonly trigged remotely and they often propagate across and beyond terrain features that would otherwise confine wind and storm slabs. Failures often propagate in surprising and unpredictable ways. This makes this problem difficult to predict and manage and requires a wide safety buffer to handle the uncertainty. 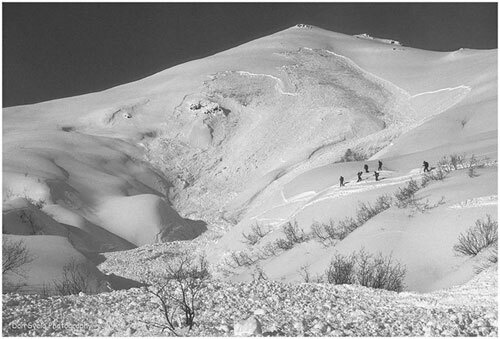 Intimate slope-scale knowledge and tracking of culprit persistent weak layers and avalanche activity over space and time will aid in assessing the severity and extent of this problem. The best ways to manage the risk from Persistent Slabs is to make conservative terrain choices.